TORONTO – The manner in which Ricky Ray has dissected opposing defences thus far in 2013 suggests that of a quarterback who is completely in rhythm with everything surrounding him. The Argonauts’ veteran pivot is in his 11th season in the Canadian Football League, an illustrious career that includes three Grey Cup titles, two of which came while he was a member of the Edmonton Eskimos in 2003 and 2005. Sunday night marked the fourth time that Ray has faced the Eskimos since being dealt to Toronto during the 2011 off-season. In three starts against his former squad a year ago, Ray connected on 71.9 per cent of his pass attempts for 788 yards, four touchdowns, and two interceptions. On Sunday night, however, Ray’s 413 yards passing accounted for over half of the yardage that he totaled against his former team in three games last season. The 33-year-old Californian completed 30 of 35 pass attempts and threw three touchdowns en route to a 36-33 victory, extending the Argonauts’ season-best winning streak to four games. During the Boatmen’s impressive four-game run, Ray has completed 64 of 73 passes for an astonishing 87.7 per cent completion rate. Despite missing one game due to a knee injury, Ray still finds himself pinned atop the CFL in many statistical categories including completion percentage and quarterback passer efficiency. If the CFL season ended as of today, Ray’s 78.1 per cent completion rate would be a new CFL record for the highest completion percentage in a single season. Calgary Stampeders offensive coordinator Dave Dickenson currently holds the record as he connected on 74 per cent of his passes during the 2005 CFL season as a member of the B.C. Lions. In that very same year, Dickenson also set an all-time CFL record with a passer efficiency rating of 118.8, a mark that is also in jeopardy as Ray currently boasts a rating of 133 through seven games this season. Ray’s 1,768 passing yards currently rank second in the Canadian Football League behind Hamilton Tiger-Cats quarterback Henry Burris, who has tallied 2,136 yards through the air. His 14 touchdown passes also rank second while he and Saskatchewan quarterback Darian Durant are the only starting pivots that have yet to throw an interception thus far in 2013. The stretch of games that Ray is alluding to was the Argonauts’ five-game winning streak, which began in week 18 of last season and continued throughout the playoffs en route to capturing the 100th Grey Cup championship against the Calgary Stampeders. 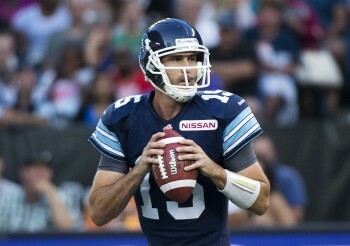 Meanwhile, during the 2012 regular season, Ray set a new Argonauts franchise record for completion percentage as he connected on 68.6 per cent of his passes while throwing 20 touchdowns in fourteen games. As surprising as it may seem, the veteran signal caller admits that he often likes to analyze his personal statistics in order to gauge what areas of his game are in need of some improvement. Although things may be clicking on all cylinders as of right now, the Argonauts’ future hall of fame quarterback understands that there is still plenty of games to be played, and with that will come some adversity that may make it difficult to maintain his record-setting pace. For Argonauts head coach Scott Milanovich, the second-year bench boss believes Ray’s success comes as a result of his familiarity within the team’s offensive system and a receiving core that boasts two of the league’s top pass-catchers in Chad Owens and Andre Durie.